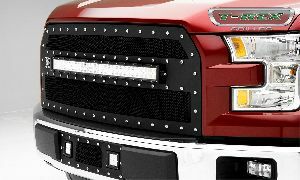 Showing 1 - 10 of 17 Products for Grille. Aggressive. Powerful. Unforgettable. 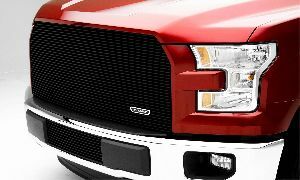 These are all words people will be using to describe your truck with the T-Rex Torch Grille. 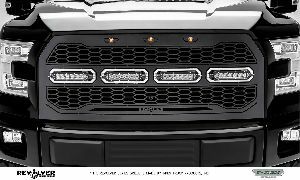 By integrating a high power LED light bar with their iconic X metal grille, T-Rex has succeeded in creating the perfect mix of style and performance and the result is the hottest trend in aftermarket grilles - the T-Rex Torch Series grille! 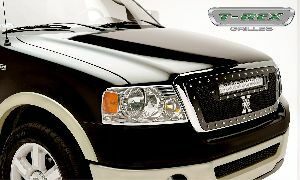 Stealth Metal Grilles have all the great features of our regular X-metal and Torch grilles. 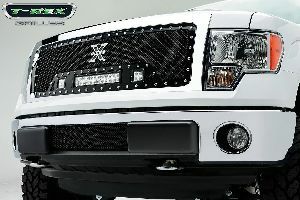 All Torch grilles and most popular X-Metal grilles are now available with the addition of stealth black studs. 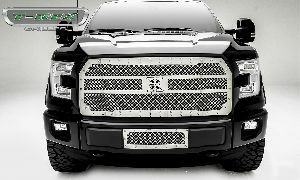 These blacked out grilles support the desired blacked out look that is so popular today and will give your truck the stealth look to really standout from the crowd. Aggressive, Powerful, Unforgettable. These are the words people will be using to describe your truck with the T-Rex Torch Grille. 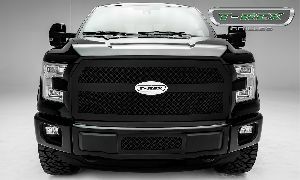 By integrating a high power LED light bar with their iconic X metal grille, T-Rex has succeeded in creating the perfect mix of style and performance and the result is the hottest trend in the aftermarket grilles, the T-Rex Stealth Torch Series LED Light Grille!